Natural Resources Canada, through the Canadian Forest Service, maintains two national research forests: The Acadia and Petawawa Research Forests. These living laboratories have a long legacy of providing scientific data that inform researchers, scientists and industry about long-term trends to help them address forestry issues now and in the future. The knowledge gained from research conducted at Acadia and Petawawa will continue to enhance socio-economic benefits for forest management practices around the world and aid in forest policy decision-making. NRCan is dedicated to addressing current forestry issues, while providing the opportunity, under secure conditions, to investigate anticipated forestry issues that have yet to arise. The Acadia Research Forest (ARF) is located 20 km northeast of Fredericton, New Brunswick on Highway 10. Established in 1933, the ARF continues to operate as one of the oldest and longest-running research forests in Canada. The ARF contains some of the oldest documented forest research studies in Canada, including seedling experiments established in 1923, which the ARF maintains to this day. These ongoing studies represent a wealth of knowledge and a scientific legacy that continues through various new and innovative forms of research. The importance of the ARF as a secure place to conduct long-term research and as a demonstration, training, and educational facility has never been greater. Research forests play a valuable role in addressing the needs of Canada’s forest industry and contributing to the competitiveness of Canada’s forest sector. The knowledge gained from research conducted at the ARF continues to enhance forest management practices and aid in forest policy decision-making. Since its creation, the ARF operates as an outdoor laboratory for forestry research, providing scientists with secure, long-term research sites. This mandate has been an integral part of the forest’s history, as the oldest research sites still maintained at the ARF date from before the forest was founded. Education and training have also been integral to the ARF from its very beginnings. Students establish a permanent sample plot in the Acadia Research forest circa 1930. Helmholtz Coils with a geomagnetic observatory fluxgate magnetometer at the centre of the coil ready to be calibrated. 1920s – Silviculture research starts on future site of the ARF with studies on stand development, forest ecology, response to thinning, partial harvesting methods, nursery practices, reforestation techniques, and site classification. 1930s – Site developed through labour provided by Department of National Defence’s relief camps. Between 1938 and 1939, the ARF begins offering 9-week “Youth Training Short Courses in Forestry” to young farmers. 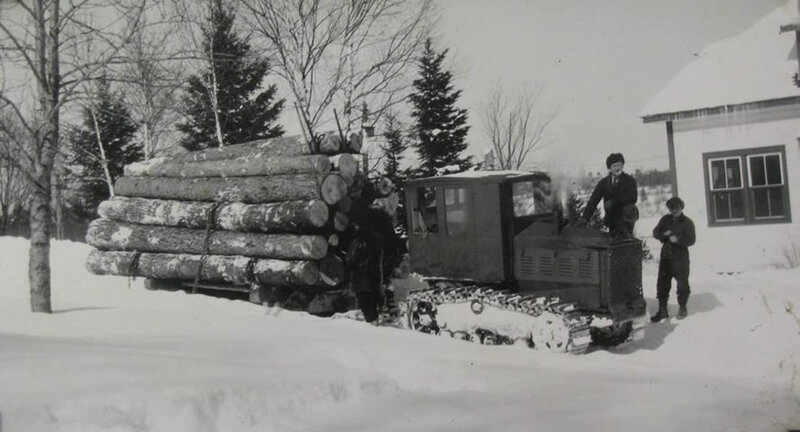 1933 – The ARF begins inventory of the forest near Fredericton, New Brunswick. 1940s – During the Second World War, the Department of National Defence used the ARF as an internment camp with work carried out by inmates. 1950s – Silviculture research continues; tree improvement program formalized, which marked the beginning of many collaborative experiments done at the ARF; research into spruce budworm epidemic begins. 1960s – Spruce budworm research continues at the ARF and timber sales begin. Annual production at the nursery reached 100,000 seedlings mid-decade; large-scale timber sales revenue began. 1970s – The ARF increases its emphasis on hardwood management, including commercial thinning and other partial harvest treatments; spruce budworm research winds down as epidemic concludes. 1980s – The ARF continues to be primary field research facility, while CFS nursery is relocated to the newly constructed Atlantic Forestry Centre, in Fredericton NB. 1990s – The ARF continues to develop sustainable forest management and implements best management practices (BMPs). 2000s – The ARF continues many studies, including Acadian alternative silviculture, white spruce genetic thinning as well as red and black spruce hybrid experiments. Some of these studies lead to the registration of some herbicide products currently registered today in Canada. 2010s – In collaboration with its partners, the ARF establishes the University of New Brunswick’s Ecological Monitoring Tower and Canada’s National Geomagnetic Calibration Facility. In 2014, post-tropical storm Arthur caused a blowdown of natural stands and research plantations, leading to a series of salvage harvest operations in early 2015. The ARF contains a number of genetic, provenance and tree improvement plantations, hundreds of research sites, and ecological reserves representing a variety of natural forest conditions common to the Acadian forest region. Research activities include studies on forest inventory, climate change, insect and disease life cycles and control, tree growth, timber harvest methods, tree improvement, biodiversity, species at risk, and endemic spruce budworm populations. The Accuair® Wind Tunnel is a state-of-the-art facility used to measure how pesticides disperse when sprayed from an airplane under various flying conditions. Before 2003, the wind tunnel functioned as a portable research unit but has since been made a permanent fixture at the ARF. It is now owned, operated and managed by Forest Protection Limited. LiDAR Technology Light Detection and Ranging (LiDAR) is changing how forest inventory is carried out. Leading Edge Geomatics, a Fredericton-based company, tests equipment and develops their LiDAR products at the ARF. As a result, LiDAR information has been acquired at different intensities over the past few years for the entire ARF, and is being used to highlight and promote the power of using LiDAR technology for forestry applications. Ecological monitoring tower – This 31m tower, launched in 2013 and co-managed with the Atlantic Forestry Centre, provides an outdoor laboratory equipped with a full suite of meteorological equipment. The tower is capable of measuring carbon fluxes, water and energy exchange in the air and soil, temperature, humidity and atmospheric pressure. Geomagnetic calibration facility – The latest addition to the ARF’s suite of high-tech installations is a geomagnetic calibration facility. Completed in 2016, this specialized facility is used to calibrate equipment that monitors, forecasts and reports on the earth’s magnetic field and on space weather, which can cause disturbances such as power outages and disruptions to GPS navigation systems. The national geomagnetic calibration facility in the ARF. Collaboration has always been an integral part of the research activities at the ARF. Allowing researchers from other organizations to work with the CFS at this research field station has resulted in some exciting partnerships. Stream electrofishing by Maritime College of Forest Technology students. The ARF has long served as an education and training facility due to its proximity to the University of New Brunswick and the Maritime College of Forest Technology. Each year, the ARF hosts classes and labs for road construction and maintenance, Acadian silviculture methods, and a comprehensive two-week wildlife camp for second year students. Located about 20 km north-east of Fredericton, New Brunswick on Highway 10, the ARF is representative of the Acadian Forest Region in New Brunswick and Nova Scotia. Acadia Research Forest headquarters on Highway 10 near Fredericton, New Brunswick. The climate in the ARF is a mixture between maritime and continental, but is slightly warmer than most parts of the region due to its proximity to New Brunswick’s Grand Lake. The average growing season is 91 days, with an annual precipitation averaging 1143.5 mm. The coldest month is typically January (average historical temperature of −12°C) while the warmest month is July (average historical temperature of 20°C). Map of the Acadia Research Forest. The ARF welcomes visiting groups and encourages educational tours for forestry professionals, research scientists, interest groups and students from around the world. As a part of the large tract of protected lands known as the Burpee Game Management Area, the ARF does not permit hunting, trapping or snaring within the boundaries of the forest. However, recreational fishing is allowed in the small brooks throughout the forest. Recreational ATVs and snowmobiles are discouraged on the property, as the forest is not part of provincial trail networks. For more information, please contact: John McMullen, Chief, Acadia Research Forest. The Petawawa Research Forest (PRF) is a longstanding laboratory and research site located in Chalk River, Ontario, northwest of Ottawa in the northern portion of the Department of National Defence’s (DND) Garrison Petawawa. Established in 1918 by the Canadian Forest Service (CFS), the PRF brings the Government of Canada together with stakeholders to contribute to the protection, sustainability, innovation and economic development of Canada’s vast forest resources. As this “living laboratory” enters its second century of operation, the PRF continues to inform forest research and management practices in Canada and around the world. The forest is managed by the Canadian Wood Fibre Centre (CWFC), and is available to scientists and collaborators from across federal and provincial departments, academia and industry. 2018 marks the 100th anniversary of the PRF. It is the oldest continuously operating research forest in Canada and home to some of the oldest permanent sample plots in the country. The PRF’s longstanding dedication to sustainable forest management and research makes it a significant source of knowledge for forest researchers and an invaluable historical and scientific legacy for Canadians. 1918 – The research forest is established by the Canadian Forest Service (CFS). A permanent sample plot is installed that will become Canada’s oldest continuously measured forest plot. 1920s – The focus on silviculture expands to fire research and forest measurements. 1930s – Canada’s first Forest Fire Hazard System is developed and fire suppression equipment is tested. 1940s – Two-minute test fires are conducted as part of a national study of fire behaviour in various forest fuel types. 1950s – Researchers concentrate on breeding better strains of larch and spruce for reforestation east of the Canadian Rocky Mountains. 1960s – Methods for effective plantation establishment are tested. 1970s – A gene pool of white spruce from the Ottawa Valley is proven to significantly outperform other seed sources and will later be used in planting programs across eastern Canada. 1980s – Researchers develop remote sensing technologies and predictive modelling for forest fire management. 1990s – The Molecular Genetics and Tissue Culture Project studies genetic transformations and develops the world’s largest collection of conifer DNA and genomic DNA banks. 2000s – The PRF forms collaborative partnerships for remote sensing tools, climate change impacts, forest biomass supply, and new silvicultural techniques. 2010s – The PRF is named Canada’s National Forest Capital for 2017 to 2019 for its invaluable contributions to sustainable forest management. 2018 – The PRF celebrates its Centennial – the past meets the future in a landmark for Canadian forest science and technology. Click on the image to see a larger version and description. Many long-term studies have been conducted at the PRF. Studies on silviculture, forest fire, forest ecology, tree genetics, and other topics have resulted in the creation of approximately 2,000 experimental research plots. The research continues to contribute to regional and national forest management practices. A red pine forest within the Petawawa Research Forest. Studies at the PRF are investigating forest adaptation to a changing climate and methods to support Canada’s transition toward an innovative, forest-based bioeconomy. A red pine thinnning research trial in the Petawawa Forest. The PRF encourages collaboration among government, private sector, academia, and other organizations, and continues to expand partnerships to new researchers and groups. New collaborators are always welcome and are encouraged to contact the PRF. Located on the southern end of the Precambrian shield, the PRF is representative of the Great Lakes-St. Lawrence forest region. The forest contains a mixture of hardwood and conifer tree species. It spans 10,000 hectares, with approximately 8,500 hectares covered by forest and 1,500 hectares covered by lakes and wetlands. A logging forwarder brings recently harvested logs from the forest to a roadside processing site. The climate in the PRF is considered continental, but is slightly drier compared to surrounding areas due to the rain shadow effect caused by the highlands in Algonquin Park. The average growing season is 136 days, with an annual precipitation averaging 859 mm. The coldest month is typically January (average temperature of -12°C) while the warmest month is July (average temperature of 20°C). Map of the Petawawa Research Forest. The PRF is open to the public seven days a week, from Victoria Day to Labour Day, from 9:30 am to 5:30 pm. Extensive road networks are available for vehicle use throughout the spring, summer, and autumn. Please note that several remote locations within the forest are not accessible by car. During the winter months, roadways in the PRF are closed to the public. Tours may be available upon request and can be adapted to specific needs. If you are interested in arranging a tour, please contact: The Canadian Wood Fibre Centre or Peter Arbour, Operations Manager, Petawawa Research Forest. The Valcartier Forestry Research Station (VFRS) is a natural site annexed to the Laurentian Forestry Centre located 35 kilometres north of Québec City. Founded in 1934, the Valcartier Forestry Research Station (VFRS) is managed by NRCan through the Laurentian Forestry Centre and occupies an area of 68 hectares, divided between two sites. The first site, the VFRS administrative sector is part of the Valcartier Military Base and is 46 hectares. The second site, the Serge-Légaré Arboretum, is 22 hectares and was acquired by NRCan in 1987. The Valcartier Research Forest Station (VFRS). 1934 – VFRS opens as part of the Unemployment Relief program. 1930s – 1940s – VRFS employees plant trees, cut wood, build roads, establish the headquarters facilities and oversee national inventory activities. 1950s – 1960s – The VFRS expands its research areas to include forest ecology, fertilization, forest measurement, fire protection, entomology, pathology, silvicultural treatments, forest regeneration, and cutting methods. 1970s – 1980s – Expanded research work in forest genetics through the establishment of plantations and the conducting of provenance trials. Beginning of forest management projects on Department of National Defence lands. Construction of three additional greenhouses to meet the requirements of researchers working in forest genetics, seedling physiology and forest regeneration. 1990s – 2000s – Although several other research stations in Québec ended operations, the VFRS continues its activities because most of the research conducted there, including somatic embryogenesis research, contributes to the genetic improvement of forest trees used for the reforestation of Québec forests. 2010s – New research areas: potential of trees to decontaminate soil; testing of quantities of biomass in genetically modified tree plantations; and effect of biomass harvesting on soil quality. Installation of a containment facility approved by the Canadian Food Inspection Agency and of a climate change simulation system. The VFRS has several long-term facilities, including high genetic value coniferous plantations. The VFRS supports genetic improvement of trees by provenance tests, progeny tests and second generation genetic improvement clone banks. Provenance tests combine seeds covering the entire distribution range of the species, including the United States of America and Europe. The VFRS has containment areas approved by the Canadian Food Inspection Agency that are used exclusively for genomics. A unique facility in Quebec, the VFRS has a climate change simulation system. searchers use the simulator to study the effect of climate change on insects, such as the spruce budworm, or the phenology of the balsam fir or the black spruce. A work-in-progress, VFRS’ scientists seek to determine the effects of biomass collection on soil quality and the impacts of spreading biomass heating ashes on the soil. Biomass quality and quantity tests are also available. The Valcartier Forestry Research Station (VFRS) is located in the fir-yellow birch bioclimatic domain. The area has an average annual temperature of about 4 degrees, and an approximate average annual rainfall of 1,200 mm. An employee walks the road beside the research forest. The Valcartier Forest Research Station headquarters. The Valcartier Forestry Research Station (VFRS) is a natural extension of the Laurentian Forestry Centre located 35 kilometres north of Québec City. The VFRS is open to the scientific community by appointment only. For more information, please contact: Jean-François Paquet, Forester in charge of federal land management.